This Sausage is the Best! I Like the Way You Walk! As everyone knows, I admire all things Utz. So I’m not being critical here of their product, but I’m rather amused at the packaging of their Potato Stix. Growing up in Florida, Utz products were never seen but sometimes mentioned as wonderful yet unobtainable; when I moved to Maryland, I was happy to be able to at last enjoy them. Many of you may remember before the 1980s when Coors beer was not sold east of the Mississippi River. Not being able to obtain the product made it all the more desirable. Back to the Utz Potato Stix. Please look at the photo on the package and then at the actual product below; a guitar pick is provided for a sense of scale. We all laughed at the little slivers of potato, especially when compared to the representation on the package. They tasted great but seemed a tad scanty; more a sliver than a stick, we all agreed. 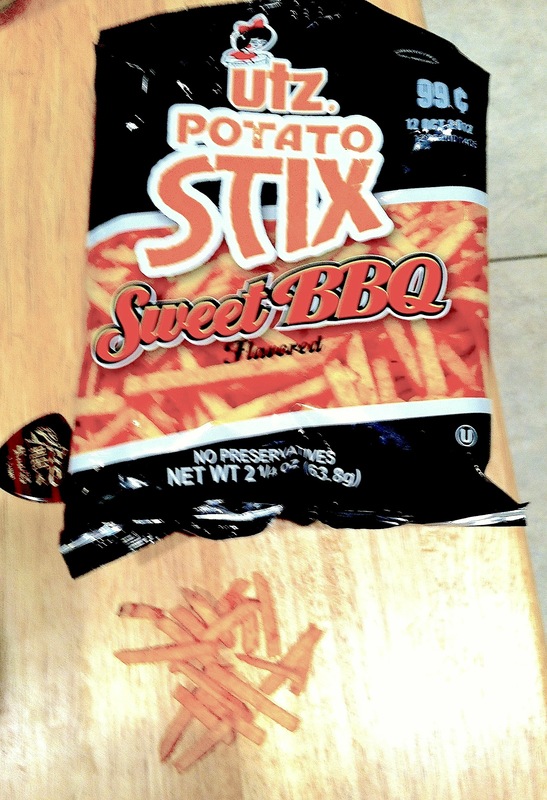 Nonetheless, the Utz Potato Stix were greatly enjoyed and everyone was happy to have encountered them. Even if they’re skinnier than expected.